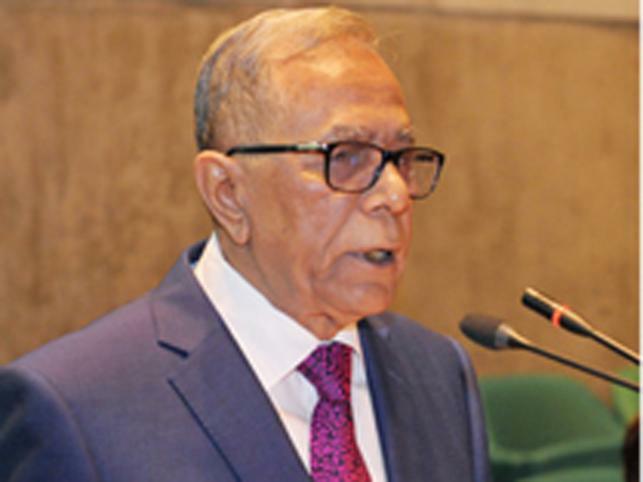 President Abdul Hamid on Sunday laid emphasis on finding solutions to climate change-related problems on a priority basis to maintain the achievements in the agriculture sector and take the successes forward. “The country’s arable land is shrinking alarmingly due to the rapid growth of population, poor land-population ratio, changes in climate and environment and fast expansion of infrastructures. We’ve to move forward with the development we achieved in the agriculture sector, overcoming the challenges, including the use of groundwater,” he said. The President was addressing a function marking the 57th founding anniversary of Bangladesh Agriculture University (BAU) on its campus in Mymensingh. “Now it’s a reality that the country is facing the adverse impacts of climate change, and its biodiversity is at risk. You’ve to give emphasis on finding solutions to climate change-related problems on a priority basis to maintain the achievements in the agriculture sector,” he said pointing at agriculture scientists. “I’m glad to know that Haor and Char Development Institute has already started its operation. You know, my home is situated in the haor areas of Kishoreganj district. I believe this institute will play an important role in developing the neglected haor areas,” Hamid hoped. The President also called agriculturists, agriculture scientists and others related to the development of agriculture for constantly contributing towards boosting production and ensuring the fair prices of agricultural produces and preservation of crops to maintain the trend of development in agriculture. “This will motivate the farmers in production,” he added. “Alongside the government, you’ll have to pay attention to this issue. Universities like Bangladesh Agriculture University should play a significant role in implementing the agriculture policy taken by this government and producing skilled agriculturists and agriculture scientists,” Hamid said. Presided over by BAU Vice-chancellor Dr Mohammad Ali Akbar, the function was addressed, among others, by Religious Affairs Minister Prof Motiur Rahman, President of BAU Alumni Association Abdur Razzak and General Secretary of the Association agriculturist Abdul Mannan. Prof Dr M Sattar Mondal, an eminent agricultural economist, educationalist and former vice-chancellor of the university presented the keynote speech while Pro Vice-chancellor Professor Dr Md Jasimuddin Khan and deputy editor of the Alumni Association Bodiuzzamaan Badsha were present.